As usual, things remain busy at EMSI. 2018 was another busy and productive year for EMSI and 2019 is shaping up to be the same way. Where was EMSI in 2018? 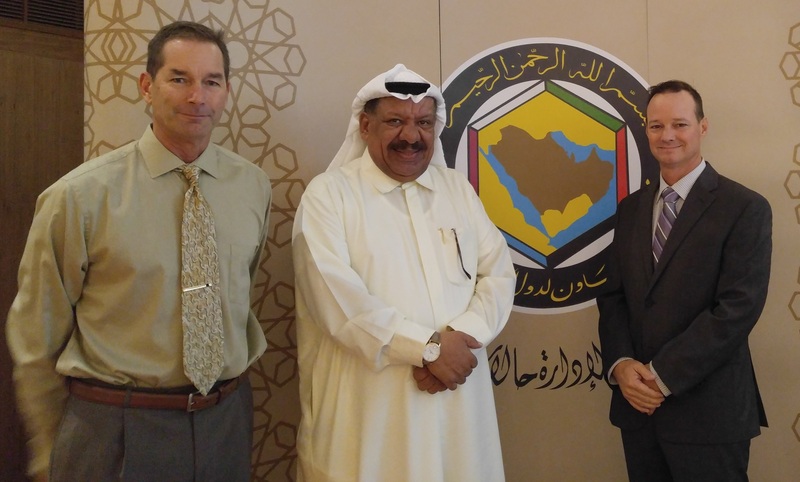 ﻿ Phill Veneris and Karl Breedlove with the Gulf Cooperation Council (GCC) in Kuwait. Calendar year 2018 started off with a bang for EMSI as we were thrust into the Hurricane Irma and Maria power restoration operation in Puerto Rico. 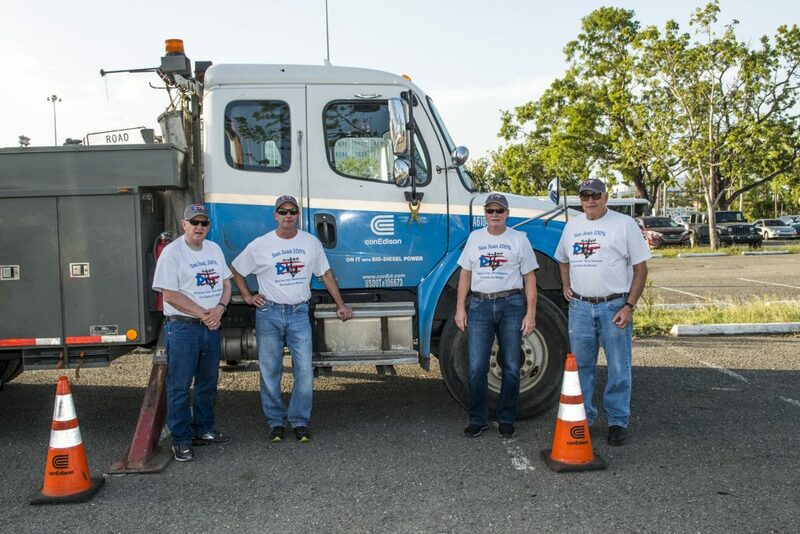 At the request of the New York Power Authority (NYPA) who were performing power restoration services in Puerto Rico via a mutual aid request, EMSI provided IMT support for over three months, working until the San Juan region was restored to 100% service. EMSI was grateful for the opportunity to contribute to this historic response effort. Left to Right – Jeff Scussel, Phill Veneris, Tom Hatcher, and Dana Simpson in San Juan, Puerto Rico helping NYPA restore power. September marked the end of the first year of our multi-year contract supporting the U.S. Coast Guard’s (USCG) national ICS training program. In Fiscal Year 2018, we delivered 12 courses to 360 students, including eight Area Command courses. Speaking of Area Command training, in August we delivered an ICS-620 Area Command course to Atlanta-Fulton County Emergency Management. Funded by the Atlanta UASI, the course was conducted to prepare responders for implementing Area Command during Super Bowl LIII in Atlanta this February (as we write this, EMSI personnel are in Atlanta supporting the management of Super Bowl security operations). While in Atlanta, we also conducted a full-scale exercise for Atlanta’s Hartsfield-Jackson International Airport that involved a fuel spill on site and designed such that airport fuel providers were able to satisfy PREP exercise requirements. Rich Wands teaching Area Command to the USCG in Yorktown, VA. In 2018, we entered the third year of our multi-year contract with the DOE / National Nuclear Security Administration (NNSA) to provide dedicated support to their offices of Nuclear Counterterrorism, Nuclear Incident Response, and Emergency Operations. Our team members planned and conducted complex national and international level exercises; contributed to plans, policies, and procedures; supported program management and programmatic analysis; and developed and delivered training. We are close to finishing an update to the DOE/NNSA Incident Management Handbook (IMH) and are in the final planning stages of two DOE/NNSA led national level exercises that will be conducted in 2019. During the spring, EMSI conducted four different activities for the National Capital Region (NCR) IMT, including an advanced Command & General Staff workshop that allowed team members to explore various team procedures and continue to fine tune team processes. As part of this training series, EMSI delivered training on establishing and managing a Logistical Staging Area. We continued our annual presence at industry conferences, such as Clean Gulf and All-Hazards IMT. In November, EMSI attended the Clean Gulf Conference in New Orleans, LA. In addition to serving as a member of the Clean Gulf planning committee, EMSI President Ron Cantin was a member of two different conference panels discussing exercise planning and response proficiency, as well as response competency and qualifications. For the second straight year, EMSI presented our ICS-220 Initial Response course to a sold-out audience at the All-Hazards IMT Association (AHIMTA) annual conference. Our ICS-220 course, which underwent a significant revision in 2017, was delivered nearly ten times to government and private sector clients. Recognizing a critical ICS training shortfall, EMSI developed ICS-220 Initial Response Team, an advanced ICS training course greatly expanding on initial response management concepts, to better prepare response personnel for managing the often chaotic and dynamic initial stages of the response, with additional focus on a prolonged posture in this critical portion of an incident life-cycle. Coupled with this course development, EMSI took the opportunity to update our Initial Response Guide Book to assist those initial responders to an incident. 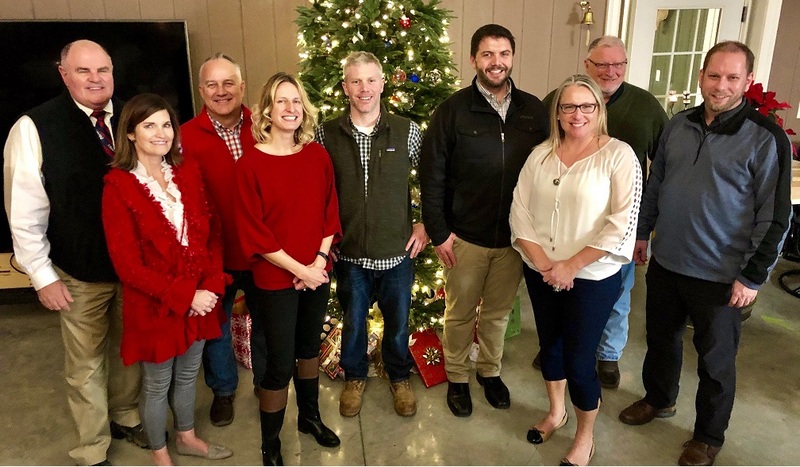 In 2018, we added new members to our team including Janet Wilson and Paul Hefner. Janet joined our corporate office staff as a Business Management Specialist, while Paul, a retired Type 1 Incident Commander and Area Commander, serves as a member of our USCG ICS-620 Area Command training cadre. 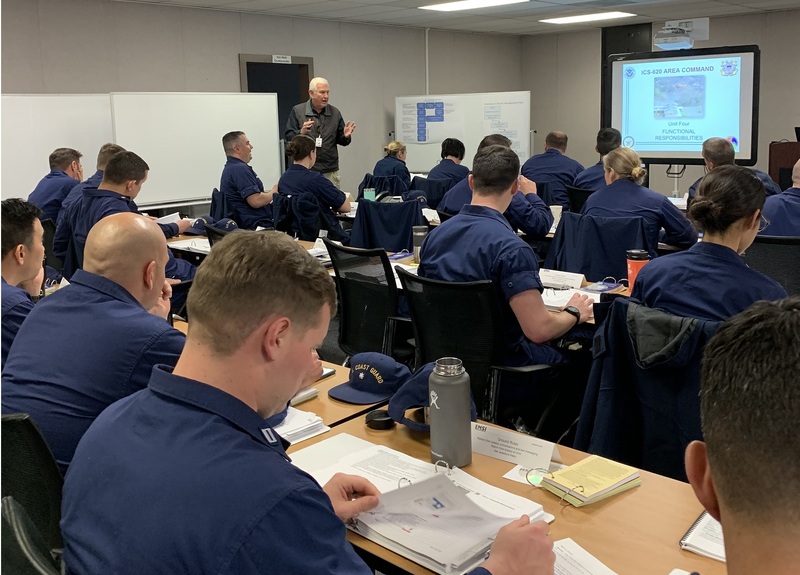 From left to right – Paul Hefner, Rich Wands, Janet Wilson, and Gary Seidel teaching Area Command to the USCG in Alameda, CA. In 2019, we welcome Todd Derum to our team. 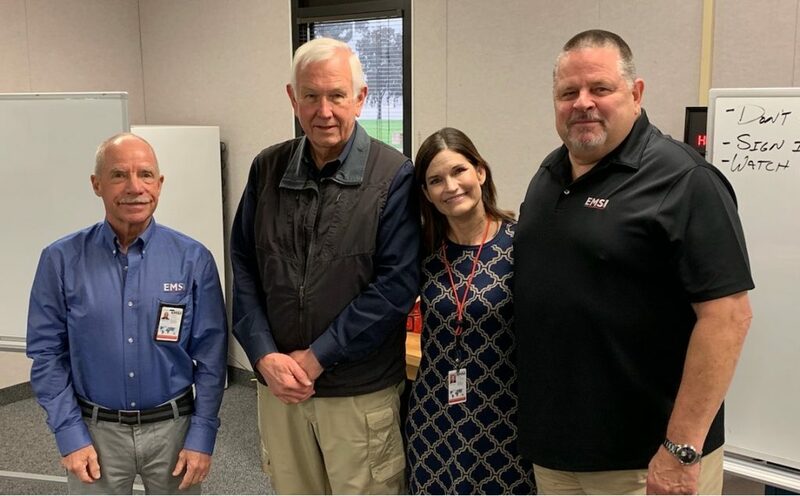 Todd retired at the end of December from CalFire after a 35+ year career, where he rose to the rank of Division Chief and attained qualifications as a Type 1 Incident Commander, Operations Section Chief, Safety Officer, and Liaison Officer. In 2017, Todd served as the Incident Commander on the Thomas Fire in Santa Barbara, the costliest fire in California history and, just prior to retirement in 2018, was the Incident Commander on the Camp Fire, the deadliest fire in California history. We also welcome Karl Breedlove to our team in a full-time instructor position. Karl is a retired USCG officer with experience in complex incident management and oil and hazardous materials response. He has directed multi-million dollar emergency response actions, including hurricane responses, major ship groundings, and pollution clean-ups, and holds ICS qualifications as an Incident Commander, Operations Section Chief, and Liaison Officer. While 2018 was a busy year, 2019 is already shaping up to be busier. In March, through EMSI Canada Ventures, we will deliver the first O-305 course north of the border in Canada to a hand-selected audience of ICS Canada stakeholders. In March, we will assist with the planning, conduct, and after-action of the NCR IMT’s annual full-scale exercise. Later this spring, we intend to deliver an ICS-420 course to members of the all-hazard IMT community, drawn from all over the U.S., looking to advance their capabilities beyond the Type 3 level. In the spring, we will also complete the year long planning effort for several DOE/NNSA full-scale exercises. EMSI exercise planners have led the planning effort for national level DOE/NNSA exercises such as Cobalt Magnet, NUWAIX, and Vibrant Response. Finally, in 2019 EMSI will release new job aids including Intelligence/Investigations, Air Operations, Supply, Facilities, and Ground Support. We will also continue to update several of our other job aids with new and refreshed content. We’re looking forward to a great year and hope to have the opportunity to work with you. EMSI is a service-disabled veteran owned, minority business enterprise (MBE) that supports a broad range of clients. To learn more about EMSI and how we can help your organization’s response preparedness, including exercise support, please visit www.emsics.com.